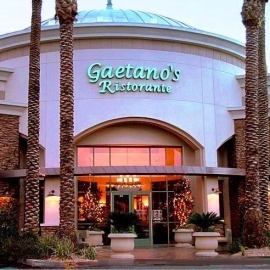 After 20 years in Calabasas, Calif., Gaetano's moved to it's present location in Henderson, NV. and has given the loclas a new place to call home. 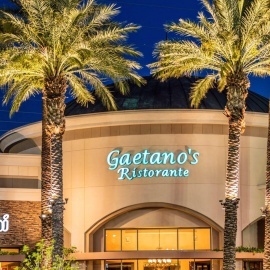 We are honored by Zagat this year be be given the status of "Best Italian Restaurant In Las Vegas", what more could we ask for. So, come in and enjoy all our home made raviolis, our amazing salads, such as our warm cabbage salad, bufalo and buratta cheese, home made soups, fresh pastas, our signature Ossobucco, and stuffed Veal Chops, our Salmon stuffed with Dungenese crab meat, our daily Risotto's, a variety of fresh fish and seafodd such as our famous Cioppino. Top it all off with amazing desserts and our special cappuccino that has no coffe in it. We have banquet facilities for up to 150 people. Ggift cards are available for an occasion and come with a gift bag and tissue paper for one stop shopping.